My phone whistled. I ignored it. It whistled again. And again. 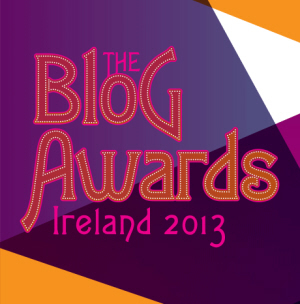 There were tweets and messages streaming from Blog Awards Ireland at the Osprey Hotel in Naas: Bibliocook had just been named Best Blog of a Journalist. There was no more ignoring the phone. The cassis was dug out of the pantry, a bottle of sparkling wine popped and we toasted my fellow finalists, including friends Aoife (Daily Spud), Imen (Farmette) and Nessa (Nessa’s Family Kitchen). There were also more toasts to the hard-working organisers of Blog Awards Ireland, category sponsors Mediabox and, clear head for Sunday beer tasting be damned, to the ever-brilliant Susan of Súil Design who, when I was recovering from a serious accident in New Zealand in 2005, decided that it was the perfect time to help me set up my long-talked about food blog. Eight-and-a-half years and 892 posts later, I’m still learning and writing and loving it. Congratulations Caroline, I didn’t think I saw you there, we know why now after such a busy day! I was surprised and delighted Caroline 🙂 Hopefully see you at Savour Kilkenny soon. I’d say my drafts folder holds another 892! Never realised, when I started blogging, how many friends I’d make through it. It’s been a superb eight years. Congratulations Caroline very well deserved, really love your blog. And a big congratulations to you too, Evan. Your blog is going from strength to strength! Huge congrats Caroline…so well deserved! You have me blushing here, Imen. That’s a lot to live up to. Keep striving forward. Congratulations, Caroline – very well deserved! I had tears in my eyes reading this – I can only say I’m surprised it took them so long to recognise your talent. I’m proud that I can claim responsibility for giving you a gentle nudge to start you on this amazing journey. One that I hope I will watch and share for many years to come. Sue, without you I’d still be talking about blogging! Talk about the best possible post-accident occupational therapy. I’d recommend it to anyone.